In 2018, Nynas turns 90. It is an exciting history of how a small Swedish oil company was transformed into a leading international operator with a focus on special products. The air was clear and a little chilly when the S/S British Earl arrived in October 1928 with the first cargo of crude oil for the newly-built refinery in Nynäshamn. Production started soon after this, and a year or so later the refinery had an annual capacity of just over 300,000 tonnes of crude oil. The history of Nynas could start to unfold. The investment in a new refinery – the first in Sweden – was important, not only for the company’s founder Axel Axelsson Johnson, but also for the country as a whole. During the Second World War Nynas played a prominent role in supplying energy in Sweden by developing methods for manufacturing oil products made of coal and tar. When the situation returned to normal after the war, the business expanded and the product range at one time had almost 400 product variants. Axel Axelsson Johnson realised sooner than many others what the impact of car ownership would be. In the early 1930s he invested in a new cracking plant, and he was also the first in Sweden to use a technology that made it possible to manufacture petrol with a significantly higher octane level than before. 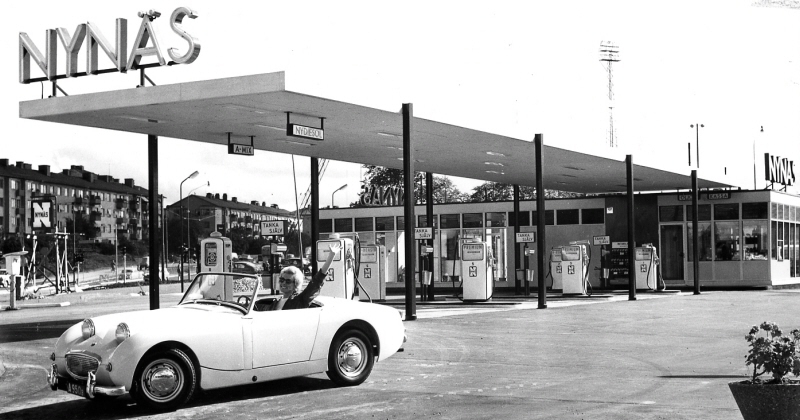 This marked the beginning of the national network of petrol stations that Nynas ran until 1981. The energy crisis in the mid-1970s caused Nynas to experience a serious cost crisis. The situation was made worse by the revolution in Iran in 1979, and there was no longer any doubt that a new business strategy was needed. It was no longer possible to manufacture petrol, diesel, fuel oil and lubricants for the domestic market, but specialisation and internationalisation were now required. The strong traditions of research and development were one contributory reason why this bold transition was successful. 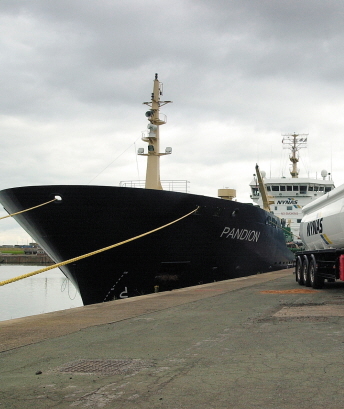 An important stage in the new strategy was the acquisition of a refinery in Antwerp in 1985 and, above all, the purchase of the UK company Briggs Oil in 1992, which included the refineries in Dundee and Eastham. This saw Nynas assume a position as one of the leading operators in the European bitumen market, with a distinct focus on special products. In parallel with the expansion in bitumen, significant investments were made in order to strengthen the production of naphthenic specialty oils. This involved not least of all development work in the field of catalyst and hydrogenation technology, which resulted in, among other things, the launch of a new kind of transformer oil. Gradually the product range widened to include special oils for items including graphical paint, tyres and industrial lubricants. Oils were also developed that complied with the new environmental requirements that come into force in 2010, when the EU banned aromatic oils in car tyres. One key factor in managing the international expansion was the fact that a global distribution network was gradually built up. This made it possible to meet the market’s strict requirements for safety, service and cost-efficiency. Thanks to its access to a large number of local depots, with Antwerp, Houston and Singapore as central hubs, Nynas can now deliver products to almost any location in the world. To meet an increase in demand for naphthenic specialty oils, especially in Asia, Nynas decided to take over Shell’s refinery in Harburg, near Hamburg. The acquisition, which was completed in January 2016, meant that the sales organisation had to be adapted so that it could sell up to 30% more naphthenic specialty oils than before. After 90 years in the market, Nynas is a leading international oil company in a number of specialist segments. The focus on products with a long useful life, in many cases up to 40-50 years, differentiates the business from traditional oil companies that focus on fuels. In other words, the unique entrepreneurial flair that characterised the company’s founder lives on with undiminished vigour.